We love the outdoors so when we were asked to attend the CCM Show we jumped at the chance. This will be Harry's first public event, so if you want meet Max Paddy and Harry and a very stressed owner please come along and get some puppy cuddles! We'll be heading down in the Woofsporter and doing a talk at 1.15pm Saturday and Sunday. 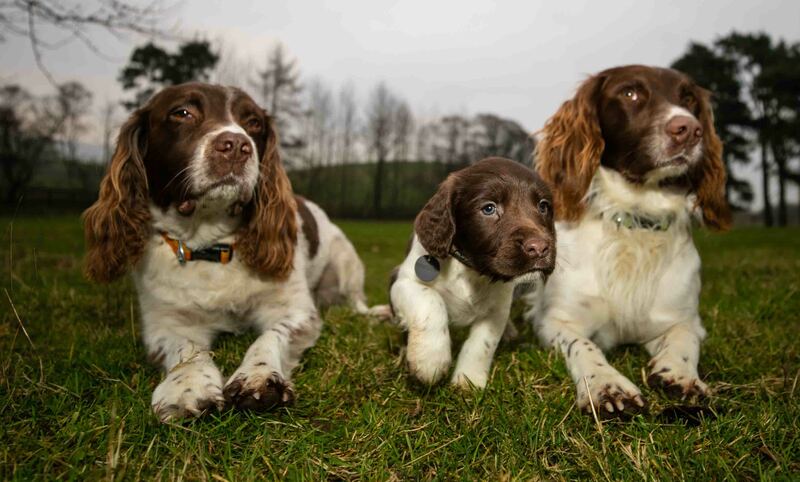 Spaniels Max and Paddy and new puppy Harry will attend the 2019 Caravan, Camping & Motorhome show. The story begins with an awful car accident that saw owner Kerry Irving, of Keswick, Cumbria, being left with chronic back and neck pain. This resulted in the active outdoor-loving Kerry housebound and taking up to 27 tablets a day and quickly led to deep depression all until he met Max. Kerry started taking Max on regular walks around The Lake District which eventually dramatically improved Kerry’s physical and mental health. Kerry started sharing his and Max’s adventures on Facebook in 2016 and once puppy Paddy joined the clan their popularity skyrocketed. Max and Paddy now have a following of over 73,000. They now take part in a variety of charity walks raising thousands of pounds for numerous good causes and they do a number of public and television appearances. All of the hard work has not gone unnoticed, in August this year Max and Paddy received a commendation from the PDSA for providing comfort, support and joy to thousands of people. And only this month they won The Great Outdoors magazine Personality of the Year – Gold Award for inspiring thousands of outdoor enthusiasts. The Caravan, Camping and Motorhome Show takes place on 19th – 24th February at the NEC Birmingham, with Max, Paddy, Harry and Kerry appearing on Saturday 23rd and Sunday 24th February. Set over five halls, the Caravan, Camping and Motorhome Show will welcome over 90,000 visitors over six days. With the largest display of caravans, campervans, motorhomes, caravan holiday homes & lodges, tents, awnings and accessories all under one roof – plus this year a whole new range of smaller and lighter tents on display – the show is the one-stop-shop to get everything you need for your next trip or with so much to see and do, simply a great day out for the family - keeping everyone entertained! With special guest appearances by celebrities, activities for the kids including the brand new Bear Grylls Adventure space and the popular ice skating area and a climbing wall, features areas such as the Top Dog Arena showing amazing agility demonstrations and theatre events - plus the chance to win some huge prizes – it offers the perfect day out during the February half term! Advance tickets cost just £8 for adults and £7 for seniors*. Tickets on the door cost £10 for adults and £9 seniors - kids 15 and under go free!